How to: Understand Lighting for People and Plants. Human and Plants use distinctly different wavelengths within the sunlight spectrum. 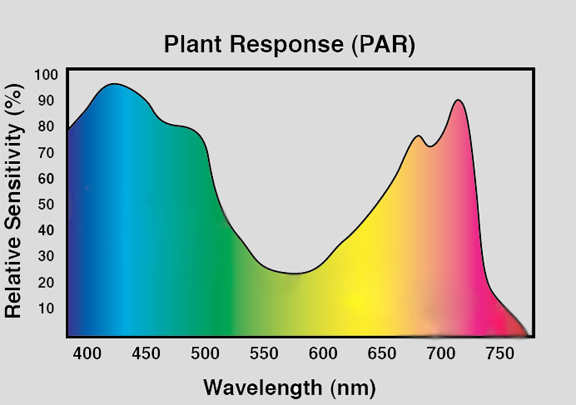 Studies have proven that plants receive some benefit with a small amount of light of the human wave spectrum but the vast majority of plant needs come from the Ultraviolet (down to 380 nanometers) and Infrared (up to 720 nm) range of the light spectrum. Plants absorb more Red, Deep Red, Blue and Deep Blue than we humans use for our vision. For plant lighting, higher lamp efficiencies, within the proper spectrums, means less operating costs by lowered wattages, lower heat generation by the lamp/ballast, maximum canopy penetration, long lamp life and minimum lumen depreciation will all contribute to succesful grows. For human vison we design lighting levels with two distinct kinds of lumen output. The first is called Photopic or Design Lumens, which represents the relative sensitivity of the eye under intense lighting such as daytime cloudless outdoor sun conditions. Photopic lumen output is registered by the cones in the human eye and is measured in Lumen, Lux and Foot Candles. Below we show how different light sources Design Lumen readings compare when read by a standard light meter and measured in Conventional Photopic Lumen values. For lighting design that wishes to maximize energy efficiencies by specifying light sources with both high Scotopic and Photopic Lumens, a Correction Factor (S&P Ratio) must be applied to the Photopic Lumen per Watt readings. When applying this correction factor you will notice drastically different usable light outputs as measured in Pupil Lumen per Watt. Higher Pupil Lumens per Watt will significantly reduce the amount of energy necessary to satisfy maximum visual acuity within the optimal yellow-green regions of the spectrum. In other words; the higher the Pupil Lumen/Watt the less energy will be required of the lamp for the eye to accurately see what it's observing. To illustrate this you can see by the charts below that the LPS (Ugly Yellow Street Lighting) lamp is more efficient from a conventional efficacy (Lm/W) perspective. However the LPS has a very low S/P ratio and poorpupil lumens per watt when compared to induction. Now the CRI and the VEL would indicate poor visual acuity. What this means is that while there may be a high lumen per watt when using LPS, the ability to accurately gauge the color of what we are observing is extremely poor. Below we show how Photopic and Scotopic Values vary between different lamp types and how bright they will then appear to the eye. This is known as Apparent Brightness and is not measured in the conventional Lumens, Lux or Footcandle readings. When taking into account the standard photometric measurements of light for human vision the system of units we measure would be the LUMEN which measures the total amount of light emitted from a light source. In the United States you'll often hear light measurements in FOOTCANDLES. This term is used alot in construction related projects and by engineers who deal with US Standards of measurement. LUX and FOOTCANDLES are different units of the same quantity in that FOOTCANDLE will measure the amount of LUMEN PER SQUARE FOOT whereas LUX measures the LUMENS PER SQUARE METER. Other then in the United States you will not usually hear light measured in FOOTCANDLES.